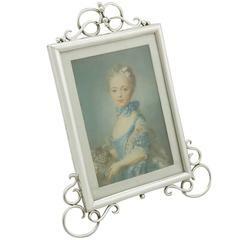 An exceptional, fine and impressive antique Edwardian English sterling silver photograph frame; an addition to our ornamental silverware collection. 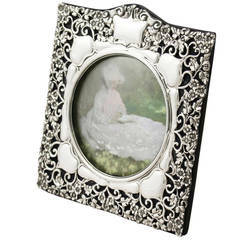 This exceptional antique Edwardian sterling silver photo frame has a rectangular shaped form with a domed upper portion. The photograph frame is embellished with impressive embossed and pierced stylised floral and scrolling leaf designs accented with segments of trellis ornamentation, all encasing the heart shaped internal window. 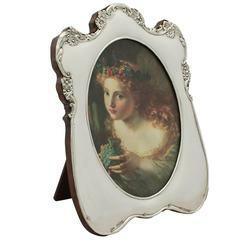 The domed upper border of the frame incorporates a scrolling leaf bordered shaped vacant cartouche. 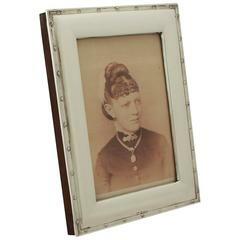 This impressive photo frame has a velvet covered back and hinged strut, secured with a swivel catch; the body and strut of the frame have been recovered in navy velvet replicating the appearance of the original covering. This fine Edwardian piece is fitted with a glass panel. Condition: This antique photograph frame is an exceptional gauge of silver, exceptional quality and in exceptional condition. The embossed decoration is very sharp. Full hallmarks struck to the surface of the frame are all very clear. Dimensions: Height 19.6cm/7.7" Width 13.5cm/5.3" Height of internal window 11.3cm/4.4" Width of internal window 8.9cm/3.5" Depth 2.6cm/1" Date: 1901 Origin: Birmingham, England Reflections in photographs may detract from the true representation of this Edwardian silver heart shaped photo frame.